Nene Matey-Keke’s enthusiasm for real estate is second-to-none. With a background in real estate and project development, construction, and financial planning, he is uniquely positioned to offer clients a well-rounded perspective, breadth and depth of knowledge, and valuable connections. He is a strong proponent of education. Over the course of his career, he has earned six professional licenses, four designations, and nine certifications (including working with seniors, relocation, and international markets). He not only believes in being well-educated himself, but gives back to his community by volunteering as a first time home-buying instructor for nonprofit organizations, teaching basic budgeting skills to formerly homeless Minnesotans, and teaching high school students the importance of financial literacy and the value of homeownership through a partnership with Junior Achievement, which he established with the Minnesota Association of REALTORS® while serving on the Board of Directors. His achievements were recognized in 2014 with one of the greatest honors in the real estate industry—he was named “REALTOR® of the Year” by the Minneapolis Area Association of REALTORS® for his association participation at the local, state, and national level, attentiveness to his clients, and active volunteerism. He started his own brokerage, RNR Realty International, in 2004. Since then, it has “grown by leaps and bounds,” says Nene. He added a sales manager, 10 residential agents, and two commercial agents just to keep up with demand. MINNEAPOLIS — Most companies share a common goal of ending the year better than where they started it. RNR Realty International can certainly say they have accomplished that in 2014. The company’s principal broker and owner, Nene Matey-Keke, was recently named the Minneapolis Area Association of REALTORS® (MAAR) 2014 REALTOR® of the Year. Matey-Keke beat out more than 7,500 Twin Cities competitors to receive this prestigious award for his dedication to his clients, involvement in local and national associations, and volunteerism throughout the community. For those who know Matey-Keke, it’s easy to see why MAAR decided to present him with this award. Driven, determined, and dedicated are just a few words that family, friends, colleagues, and affiliates use to describe the hardworking realtor. As proof, Matey-Keke holds a total of 14 different residential and commercial real estate certifications and designations, and more than 25 additional certifications, which cover financial investment, community development, and construction. Having been in the real estate industry for almost fifteen years, Matey-Keke has been diligent in continually building not only his multiple businesses, but also his personal knowledge as well as his ever-growing professional network, which he does partly by maintaining membership in numerous associations and committees. At MAAR, Matey-Keke recently completed his appointment to serve on the Board of Directors and has previously been on the Finance Committee, Nominating Committee and the Young Professionals Network. He will continue his involvement with the Global Business Council and Public Affairs Committee. At the state level, working with the Minnesota Association of REALTORS® (MNAR), Matey-Keke is on the Board of Directors, Executive Committee, Commercial Forms Sub Committee, Governmental Affairs Committee, Minnesota RPAC Board of Trustees, Professional Standards Committee, and is an active participant of the Strategic Planning session. He also was a founding member of the Diversity Committee and served as the 2014 Chairman. During his tenure, he spearheaded a joint partnership between MNAR and Junior Achievement of the Upper Midwest as one way to address the current homeownership disparity. Junior Achievement now incorporates the value of homeownership for all in its curriculum. Matey-Keke’s commitment to improving diversity within the real estate industry has led to his appointment as treasurer of the recently created local chapter of the Asian Real Estate Association of America - Twin Cities (AREAA). 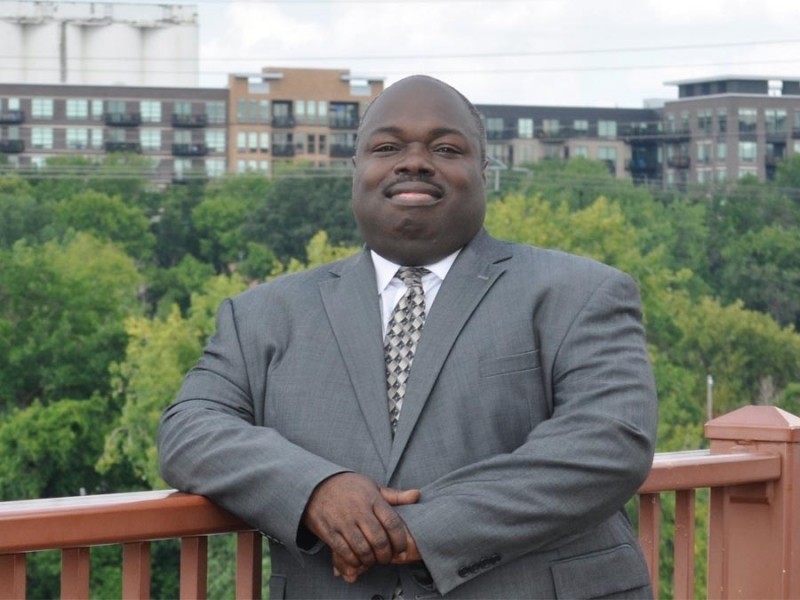 At the national level (National Association of REALTORS®), Matey-Keke is the Federal Political Coordinator assigned to the 5th District under Congressman Keith Ellison. He is also a member of the Global Business and Alliances Committee, Research Committee, and previously served on the Federal Financing and Housing Policy Committee, Diversity Committee, and Housing Opportunity Committee. In addition to his extensive REALTOR® association involvement, Matey-Keke also dedicates time to developing the commercial and investment aspects of his business, by actively participating in the Minnesota Commercial Association of Realtors (MNCAR) and the Minnesota Real Estate Investment Association (MnREIA), respectively. One of Matey-Keke’s many areas of focus is the international community. His attention to this particular market contributed greatly to his REALTOR® of the Year victory, as well as to his overall personal success. It was because of his background and interest in travelling and learning more about other cultures that he created RNR Realty to be an international business. He would like to use his recent accomplishment to push the business even farther globally, in order to help increase clients’ opportunities for relocation, purchasing resort or second properties, investment (Commercial and Residential) as well as to help make homeownership accessible to all worldwide. In fact, it was his own personal struggle to overcome past adversity and a lack of access to information that motivates him to work with underprivileged communities today. Despite his extensive association involvement – not to mention running multiple businesses – Matey-Keke still finds time to teach first time homebuyer classes for various local organizations, including Model Cities, the African Development Center, and Community Action Partnership of Suburban Hennepin (CAPSH). He has also spoken for the Minneapolis Urban League’s “Realizing the American Dream” class, which hits close to home. Recently, Matey-Keke has also begun teaching community education classes in neighborhoods around the Twin Cities, on topics ranging from purchasing investment properties to finding the best resort and second property opportunities, locally, nationally and globally. REALTOR® of the Year award winners are allowed to select a charitable organization to receive a $1,000 donation in their name. Matey-Keke chose MCASA Homes, a Model Cities program that provides affordable homeownership opportunities to low and moderate income families. He selected this program because he has previously worked with Model Cities, and he strongly believes in MCASA’s mission to put homeownership within everyone’s reach. 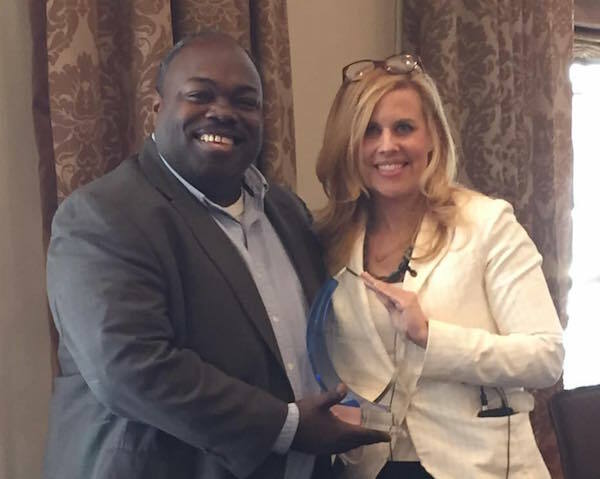 Emily Green, the 2014 MAAR President and past REALTOR® of the Year award recipient, helped name Matey-Keke as this year’s winner and presented him with the trophy. Nene Matey-Keke recently spoke with Al McFarlane of Insight News on the importance and impact of homeownership among the African American community. Other panel members included Julia Israel (Keller Williams Integrity Realty), Brian Parker (Edina Realty, The Parker House Group), and Chioma Onwukwe (Home Masters, Inc). Watch a replay of the broadcast below. MINNEAPOLIS — Metropolitan areas around the nation are experiencing a demographic shift, and Minneapolis and St. Paul are no different. 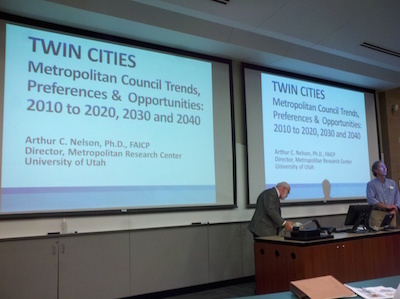 Arthur C. Nelson, the director of the Metropolitan Research Center at the University of Utah, shared his insights on this developing trend at the CURA Housing Forum held Monday, June 16th at the University of Minnesota’s Carlson School of Management. The presentation was attended by staff of RNR Realty International to determine how our clients' needs will change over time and what we can do as a company to anticipate those changes. According to Nelson, the U.S. is reorganizing itself around so-called “economic engines,” which are the main regions that dictate national economic development activity. These large urban areas – known as “megapolitans” – represent about 200 million people, or about two-thirds of America’s population, and will account for 90-95% of the country’s growth by 2050. Our local megapolitan, the Twin Cities metro area, consists of seven counties: Anoka, Hennepin, Ramsey, Washington, Carver, Scott and Dakota. Within Hennepin County alone, there are one million people and counting. Hennepin County, along with Ramsey County and the cities of Minneapolis and St. Paul (what Nelson refers to as the “Central Counties”), currently compose one-third of Minnesota’s total population and this share will only increase with time. These numbers reflect the changes that are happening across the country, brought about by increasing numbers of immigrants, aging Baby Boomers and millennials who are seeking to move to cities for better access to amenities, such as transportation, and more lifestyle opportunities. The “New Majority” consists of all persons besides non-Latino whites, mainly immigrants and children of immigrants. Until recently, non-Latino whites have always made up the majority of the U.S. population. But with the immigrant population exponentially growing, by 2040 the seemingly paradoxical “Majority-Minority” demographic will account for 91% of population growth nationwide and 100% of the change in the Twin Cities, according to Nelson. While he didn’t go particularly in-depth with the implications of these numbers, it is true that the “New Majority” will become the socio-, political and cultural drivers of the country. Consequently, their needs will determine a great deal of future housing preferences and trends. Kristina Kelly, RNR's Operations and Marketing Coordinator, questioned Nelson about this change and its relation to the future of homeownership. "I wanted to find out how the racial and ethnic disparities between the current majority and the soon-to-be 'Majority-Minority' will have an impact on homeownership in the future," said Kelly. "As a real estate company, it's important to know how these changes will affect our market." In response to Kelly's question, Nelson said that this gap is mainly due to a lack of education, and that he doesn't see there being a significant amount of growth in the future of American education to close those gaps. Nene Matey-Keke, the broker/owner of RNR and a proponent of helping members of diverse communities become homeowners, does his part to lessen the educational breach by teaching bi-monthly Home Stretch classes for first time homebuyers. Baby Boomers (those born between 1946 and 1964) and current senior citizens will account for a whopping 95% of the household change in the Central Counties between 2010 and 2040. This change is due mostly to the fact that people within this age group are becoming empty-nesters and are losing spouses from old age and other age-related illnesses. Decreases in household size for these people leads to downsizing and moving to assisted living facilities, subsequently increasing the number of homes for sale. For example, when the first of the Baby Boomers hit 70 years old in 2016, they will start to try selling their homes in large numbers (and this trend will continue through about 2034). However, because of changing demands for households (such as an increase in households without children and people living alone), there just won’t be enough demand for the drastic increase in supply. In fact, according to Nelson, there will be an excess of about 70,000 sellers in the Twin Cities metro region alone. He suggests that policymakers need to come up with a solution to fix planning and zoning policy to soften the blow. Research has shown that consumers are at their peak homebuying age between 35-64 years old. However, Nelson’s study shows that this demographic will account for a mere 1% of household growth in the Twin Cities by 2040, whereas those 65 years and older will total 95% of that share. Because of high unemployment rates and low wages overall, people that will be 35-64 years old at that time simply won’t have enough money to purchase houses, much less the McMansions and suburban dream homes that have been popular for the past few decades. According to Nelson, about 70-80% of current homebuyers want single-family detached homes. However, in the future, that will no longer be the case. People will desire – and only be able to afford – homes that are much smaller, including condos and apartments, but that are closer to megapolitan centers. Erin Reyes, the marketing and communications intern at RNR, agrees. "As a millennial, I can attest to this fact. With increasing amounts of student loan debt and a competitive job market that's keeping much of my generation un- or underemployed, for most of us, owning a home in the suburbs no longer seems feasible – or desirable. We want to be close to jobs located in the cities, which usually means choosing condos or apartments that aren't necessarily spacious, but offer us easy access to work, transportation and other lifestyle opportunities." Shrinking household sizes also play into the changing housing market. Currently, about one-third of American households have children, but by 2040 households without children will grow by 81%, and the Twin Cities number is very similar (79%). Nelson suggests that developers and builders pay close attention to all of these evolving needs of buyers and adjust their business plans accordingly. Nelson’sreportandpresentation slidesare now available online. Press Release: Foreign and domestic relations panel challenges disparities in home ownership. ST. PAUL, Minn. – Minnesota’s changing demographics brings issues of disparity in homeownership, so on Thursday, Jan. 23, a panel of minority housing representatives sought to reduce disparities within the Twin Cities. 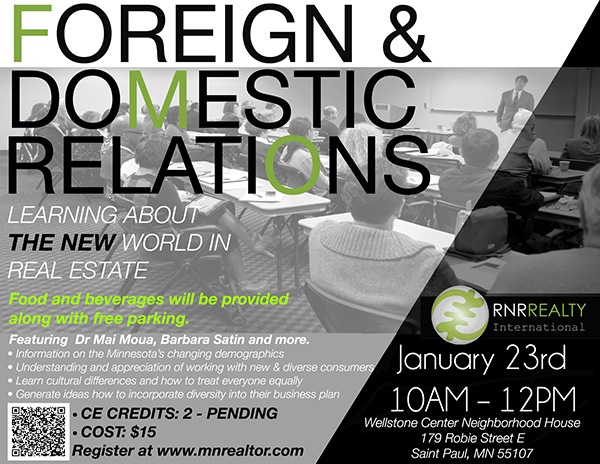 The panel was hosted by the Minnesota Association of Realtors (MNAR), and consisted of representatives from the Hmong, African American, Native American and Gay/Lesbian communities. An opening presentation by Chris Galler preceded the panel discussion. Galler talked about how factors including ethnicity, race, age, stability of home life, family traditions, the economy and level of education influence home ownership. His in-depth presentation prompted many audience questions, which transitioned to the panel discussion. According to the panel, homeownership challenges that all these communities face are rooted in the education and workforce sectors. Peoples in these communities face barriers in everything from credit issues to first-generational factors when it comes to buying a home. “I think the answers will build over time as people start to see things transform in front of them,” said Matey-Keke. He hopes the conversation will increase to include more industries and government on all levels. “This conversation isn’t unique to Minnesota,” he said. Over 20 people were in the audience for the event, which was $15 to attend. Panelists included Nick Yang, housing program coordinator for Hmong American Partnership; Brenda Bailey, director of real estate development for Model Cities; Bill Ziegler, president and CEO of Little Earth of United Tribes; and Barbara Satin, assistant faith work director for the National Gay and Lesbian Task Force. 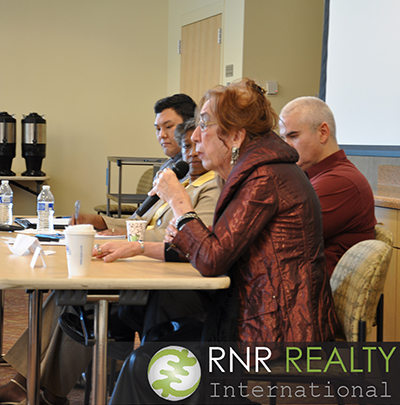 Nene Matey-Keke, broker for RNR Realty International, took part in the GSE Housing Finance Reform Roundtable on Nov. 26 in Minneapolis on behalf of the National Association of REALTORS®. In attendance were various housing experts from the local real estate community and members of government. Congressman Keith Ellison called the meeting and offered an invitation to Matey-Keke. Minnesota Association of REALTORS® (MNAR) Senior Director Christine Berger was also in attendance. The main goal of the discussion was to gain insight and feedback regarding current and future Government Sponsored Enterprises (GSE) such as Fannie Mae and Freddie Mac in regards to housing finance through loans and the wide effect it has on current and potential homebuyers as well as the renters and owners of multi-unit housing. Minnesota Housing Commissioner Mary Tingerthal represented the committee and outlined proposals for the meeting. Topics on the agenda included housing finance reform and the Protecting American Taxpayers and Homeowners (PATH) Act. Matey-Keke was chosen to be part of the meeting based on his experience as Ellison’s Federal Political Coordinator and his work as a member of the Governmental Affairs Committee and Chair of the Diversity Committee of Minnesota Association of REALTORS®. Today Nene Matey-keke and Steve Hoem represented the Minneapolis Area Association of Realtors in attending a roundtable hosted by the Alliance for Metropolitan Stability at Merriam Park Library in St. Paul. During the meeting community members, non-profit representatives, and business leaders had a lively discussion about how to best promote diversity in Minnesota and strategies to build positive and meaningful relationships between cultures. We are proud of the work being done by Alliance for Metropolitan Stability and are thrilled to be a part of the ongoing conversation. 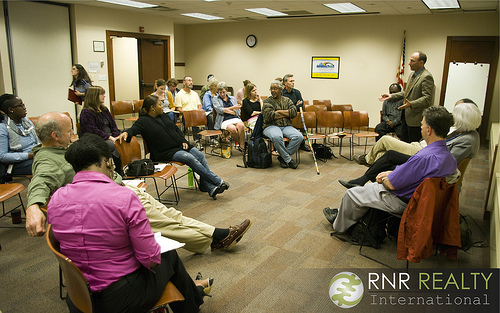 Nene Matey-keke, owner/broker at RNR Realty International, led and facilitated a meeting between Keith Ellison, the U.S. Representative for Minnesota's 5th congressional district (covering Minneapolis, St. Louis Park, Richfield, Crystal, Robbinsdale, Golden Valley and Fridley), and Minnesota realtors on Wednesday September 4th. The Minnesota Association of Realtors, representing 15,000 members, and the Minneapolis Area Association of Realtors--the largest local association of realtors in Minnesota--discussed federal legislation that has a direct effect on Minnesota homeowners and real estate markets. Discussion centered around pinpointing the best strategies to ensure that federal legislation affecting homeowners is both fair and sensible. Topics included the recently proposed PATH Act, the regulation of federal financial institutions which provide access to homeownership, and other legislation that affects Minnesota homeowners. 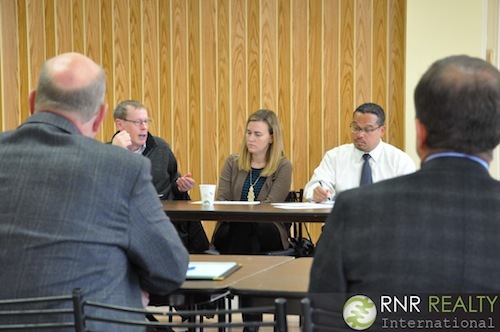 A healthy Q&A followed Ellison's remarks, and information about pending legislation and its effects was examined with input from all in attendance. The Star Tribune is the largest newspaper in the state of Minnesota and is published seven days each week in an edition for the Minneapolis-Saint Paul metropolitan area. This article discusses the MCASA homes program, a lease to own/contract for deed single family housing program in which Nene was project manager.